In the last few years, the highest spot price for silver was right around $45.00 per ounce. Recently silver has been trading at around the $27.00 per ounce mark. This means, should silver return to this high again, it could see a return of up to 66%. Although gold is also a long-trusted investment, it cannot boast these numbers like silver can. If the economy gets bad enough, we may have to pay for our goods by other means. Clearly, silver will always have value. If you suddenly find you or your family in an economic depression, how will you provide support? What do you think will be worth more, over-inflated dollars or a silver coin made of 99% pure silver? 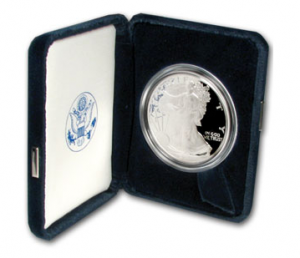 Purchasing a U.S. Mint Silver Eagle has a few benefits that other forms of precious metals do not. First of all, it is easily the most understood and recognizable form of bullion. It’s hard to dispute the quality or amount of silver in a coin when it has clearly been pressed by a U.S. government mint. Second of all, if we do find ourselves in an economic crisis, U.S. Mint silver coins will be more readily accepted as payment than rings, bracelets, or necklaces. If you are apprehensive about investing in precious metals and/or bullion in general, then silver is a perfect place to start. You should always research and seek to understand your investments as much as possible. Before trying to understand the precious metals market as a whole, just focus on silver. This will allow you to gain confidence in precious metals investing. After this, you will have a better grasp on other metals because many of the same principles apply. Ultimately, it’s reassuring to know your wealth is safe. If the dollar hyper-inflates and you already have a large storehouse of silver, then you may rest assured that your wealth will remain intact. Remember, you are not just buying silver coins, you are also purchasing peace of mind.